A swimmer’s individual needs should be mirrored in their daily and weekly workout practice plans. As the leader of the swim team, use your swimming coaching skills to come up with a plan that is best suited for the strengths and weaknesses of each individual member of your team. However, make sure to include enough variety in your coaching plan to keep swimmers engaged and interested at practices. Using my years of swimming coaching knowledge and experience, I’ve come up with the following 75-minute workout plan, which when combined with a warm-up and cool-down accounts for a full 90-minute practice time. Every swimming workout should include sufficient warm-up and cool-down time to reduce the threat of pulled muscle or overexertion. In my many years of swimming coaching experience, I’ve noticed that allowing players five minutes at the beginning of practice for underwater tag works much better to warm-up my team than having them swim slow laps. Since most of the practice will be focused on swimming laps, my team loves to break up the routine and have some fun at the beginning of practice. Plus it helps foster the competitive spirit that all good teams bring to each and every practice and competition. Once the warm-up is completed and everyone’s heart rate has risen and their muscles are lubricated and ready to go, it’s time to start the workout plan. To begin, have your swimmers start off with 400 meters in the stroke of their choice. Next we do 8 sets of 25 meters in the drill of the day to focus on technique. 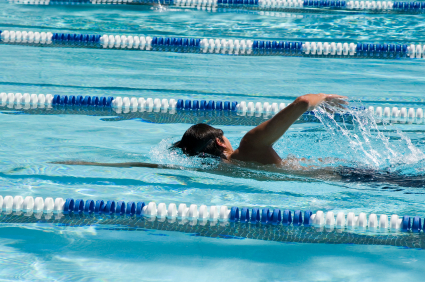 One of the main advantages of this swimming program is that all swimmers can be performing the same stroke or each can practice the stroke that requires the most practice. This is followed by 6 sets of 75 meters using only the arms. Have swimmers perform these laps with a plastic buoy between their legs if desired. Next comes 8 sets of 50 meters focusing on the kicking. For these laps, I have my swimmers hold on to a floatation device such as a kick board or if so desired, wearing flippers for added resistance. Next we swim 4 25 meter sets in the stroke of choice focusing on speed. After these fast laps, I allow my team a one minute rest period before proceeding. Next, my swimmers swim 3 sets of 100 meters of the stroke of the day at an even pace, followed by 1 50 meter swim of the same stroke at a slow pace. This is followed by another 3 sets of 100 meters in the stroke of the day, but this time the 1st 100 meters is swum at a moderate pace, the next 100 are swum faster and the final 100 meters are swum the fastest. After this, the team swims 50 meters in the same stroke but at a slow pace. Then, have your swimmers repeat the process—3 x 100 evenly, 50 slow, 3 x 100 moderate, fast and fastest. Finally, swimmers perform a 100 meter swim slowly to cool down.